Ryanair is to operate 17 new routes to Greece, giving people eager to experience the country a greater choice of carriers. The airline will start running the new additions in April and they will include flights to top holiday choices Thessaloniki, Rhodes and Kos. Ryanair is offering a million seats for about £5 in a sale to celebrate its 30 Greek routes. The offer covers travel in late February and March on Tuesdays, Wednesdays and Thursdays. No matter how much a seat to fly off into the sun costs, the trip could still face problems with lost or stolen items or delayed flights so it's always worth tourists taking out travel insurance to make sure they can really enjoy their trip. 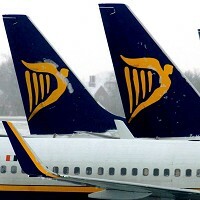 Low-cost carrier Ryanair said it expects its traffic to Greece to hit more than 700,000 people this year. Spokesman Stephen McNamara said: "Ryanair is delighted to boost Greek tourism and the Greek economy with 17 new low-fare routes to Kos, Rhodes and Thessaloniki, including new routes to currently un-served markets such as Lithuania. Ryanair's 30 Greek routes will deliver 700,000 passengers per annum, sustain 700 local jobs and ensure over 357 million euro (£297m) to the local economy."